Impressively, this was the first time that all four finalists scored eight out of eight cups correctly in the open round. 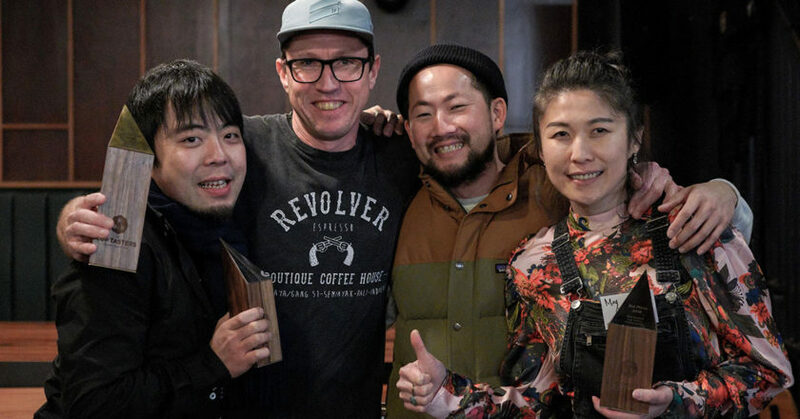 This included Takahito Koyanagi of Toasted Espresso in Auckland, 2016 NZ Cup Tasters Champion; Woo Hyung Lee of Camper Coffee who entered at the last minute; May Chan of Story Coffee in Auckland; and Stu Hargie, representing Jacobs Douwe Egberts and 2011 NZ Cup Taster Champion. With a perfect score in 4.11 minutes, Stuart Hargie won the New Zealand Cup Tasters Championship for a second time. “It’s an honour to be competing with such talented people. There were such high scores this year,” Stuart says. Stuart is looking forward to the international competition but says experience competing on the world stage isn’t always an advantage. “Tasting is about your sensory perception, confidence on the day, your health and nerves. If any of those four aren’t working, tasting against the pressure of the clock can be challenging,” he says. Thanks to sponsors Amc Roastery Supply, Ozone Coffee Roasters, Acme & Co, Marco Brew Gear, Cafetto, Castaway, and hosts L’affare. Two days after the Cup Tasters Championships, Kōkako Organic Coffee Roastery held the Meadow Fresh New Zealand Latte Art Championship on 29 July. The event featured interactive pouring competitions, with a chance to win some amazing prizes for professionals and emerging artists. Sustainability was a key focus and this element was nailed as the attendees got behind the “bring your own mug” competition. Two-time winner Sam Low emceed the event following a day of calibration with the judges. Congratulations to all 17 artists from Invercargill to Auckland who battled-it-out in a tense day requiring nerves of steel. The designs were poured, and the final six competitors were announced. The final round allowed the competitors 10 minutes stage time. They were asked to pour three matching sets of six drinks: two separate sets of matching free pour lattes and one set of matching designer pattern lattes. The artists were able to use food colouring, but this was limited to one colour and to highlight only. Meadow Fresh New Zealand Latte Art Champion Runner-up Charanjeet Singh Saini of Global Byte Cafe in Invercargill was a first-time competitor, with Isabella Brown of The Block Cafe in Auckland finishing third place. For the second year in a row, it was Leo Li of Auckland’s Atomic Coffee Roasters who was crowned Meadow Fresh New Zealand Latte Art Champion. Leo says even knowing what to expect, he found the lead-up to this year’s competition very difficult. He practiced for up to three hours a day for two months to create his latte art, which included a gold fish, snail and dragon. Thanks to the support of our Meadow Fresh New Zealand Latte Art Championship sponsors for helping make this wonderful event posssible: Meadow Fresh, Amc Roastery Supply, Acme & Co, Kōkako, Cafetto, Castaway and La Marzocco. In addition, a massive thanks to all our sponsors, venue hosts, volunteers, judges, spectators and coffee companies who support our competitors and events. Stuart and Leo will now represent New Zealand at the World Coffee Championships in Brazil during International Coffee Week.